Tailoring business application can do more ! Every user likes online shopping to buy their apparels. People don't like to wear ready to made apparels as much as before they doing because it ruins their look & confidence. Their next choice will be customized apparels. But the difficulty in selecting the customized apparels is people should go and visit tailors shop for their work to be completed. Here is an idea for tailors to satisfy their consumer needs without visiting them directly. Tailors should establish their presence in an online tailoring platform to showcase their works and attract more customers around the world. In digital world, there are huge number of softwares and scripts with advanced features for tailors to develop their online tailoring business quickly. One such software is Fit4bond - custom tailoring business software that contains more advanced features to run tailoring business in online. By using this tailoring application, tailors can develop their tailoring business with apparel designing, shopping cart, online checkout, payment gateway & wallet integration by fulfilling all the business needs. 1) Apparel Designing Operation can be done by apparel designer. 3) Fitting can be done by immersing virtual fitting room with mix and match technologies. 3D realistic showcase, is the best option to displaying their designed apparels can drag the customers to the conversion ratio. Virtual fitting room with Mix and match technologies, online body measurement tips can make customers feel satisfied by placing an order in your tailoring website. These above three highlighted features can convert more audience to customers. By installing online tailoring business application into website, tailors can convert their tailoring business as a wealthy one by generating high revenue. Online tailoring business application provides a highend business platform to design online tailoring store with new features that converts more sales. Shopping cart experience with top-most international payment method like paypal, ccavenue and so on, it builds user experience on shopping cart. With easy usage of shopping cart experience that creates more sales into tailoring store. Tailors can integrate new e-commerce features like drop shipping in their website for quick & easy shopping. Online tailoring business application has these features as readymade solutions to build tailoring business store with more convenience & satisfy customers needs instantly. If tailors use tailoring business application, they can clarify customers doubts with 24*7 chat support by freezing one dedicated sales person. Modern tailors , Custom tailors, Bespoke tailors can build their online tailoring store easily where customers can buy and customize their apparels with few clicks. Powerful tailoring applications can grow your tailoring business. This is true with Fit4bond-online tailoring software for great tailors. 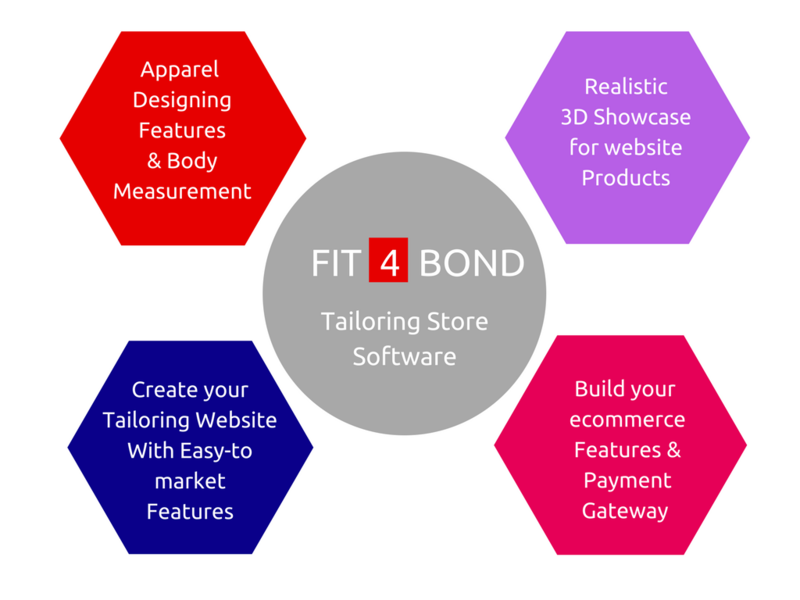 Fit4bond - A right software for custom & Bespoke tailors to build their online custom tailoring store with advanced features.Fit4bond launched its new version in the form of wordpress plugins for wordpress websites so that tailors can develop their tailoring business websites. online tailoring business store,online tailoring software,custom tailoring business software,Online tailoring business application,custom tailoring platform,Wordpress Plugin for Online Tailoring Business, custom shirt design software.